If you are fond of tagging your furry friend to parks or you like bringing him to outdoor activities, at some point, they are most likely to ride your car. Some dogs are not a fan or riding cars and would end up messing your upholstered seat. Hence, you should consider investing in a dog car seat. For other people, a dog car seat is just another expense. But for pet parents, it is such an essential tool every pet owner must have. A quality dog seat cover can prevent your dog from leaving odors when he makes an accident inside. It can also protect your backseat and ensure that he will not tear the fillings with his paws. Now, if you are interested in investing one, we’ve rounded up ten of the best car seat covers in the marketplace today. From the most stylish to most durable, rest assured that you and your dog will enjoy frequent car rides from now on. First on the list is this dog seat cover from Bowsers. Its durable microvelvet fabric is both stylish and functional. You can protect your backseat from accidents and stains. Any pet owner, no matter how much they love their dogs, wouldn’t appreciate if they mess with their car. The polyester-filled bottom and rigid foam-filled sides ensure that your pet is comfortable while riding. It is designed to fit all cars. The durable nylon straps and clips secure the fit of the seat cover while you are driving. There are convenient slits for seatbelt use. The side paddings will assure you that your dog wouldn’t end up scratching the car doors in case they wanted to view the window. Now you can bring your dog outdoors anytime you want without the fear they would ruin your car. This hammock car seat cover from LerriPets provides comfort to your dog and protection to your seat the entire ride. Thanks to the improved design of manufacturer, cheap plastic locks are replaced with an adjustable single-piece broad strap instead. Rest assured that with proper care and maintenance, this product can last for years. The package includes a pet seat cover, two nylon-fabric safety belts, and a storage bag for your convenience. The seat cover is made of padded heavy-duty waterproof polyester Oxford 600D that can provide complete protection to your car from pet hair, mud, and dirt. This convertible hammock stays in place thanks to its non-slip bottom. The seat anchors with Velcro closures for seat belt openings and an adjustable headrest straps to keep it in place while the car is moving. You can clean this seat cover with a damp cloth or vacuum. It is also safe to use a washing machine for this product. Behold for the newly-improved design of Piero Lorenzo dog seat cover. It is made of 900D oxford fabric and waterproof cloth. The soft cotton layer ensures that your pet is comfortable sitting or sleeping on it. It also features a slip-proof PVC net to keep the seat cover in place when driving in rough roads. This product is built to last a long time with materials that can withstand your pet’s scratches and nails. You can install this product without difficulty thanks to its quick-release clips. The seat anchor can be inserted into the crevice in fastening the cover and four seats of adjustable plastic clips to ensure that it will stay on the place once installed. Spoil your dog with this luxury seat dog cover from Floppy Ears Design. 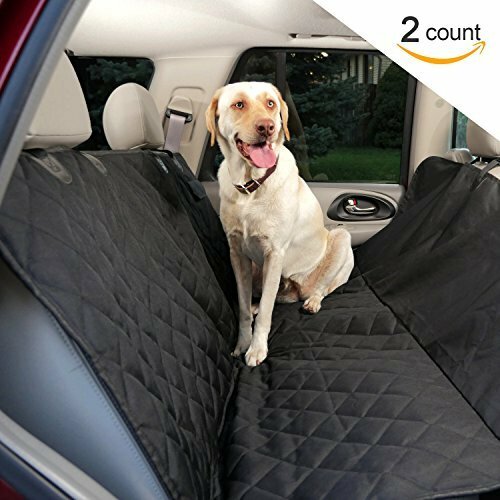 The waterproof microfiber material keeps your dog comfortable and the seats dry. Its generous size protects the entire back seat, back of front seat, and foot wells of the vehicle. This hammock is reversible with heavy-duty microfiber on one side and thick tipped fleece on the other side. You can also unzip the hammock if you want other people to use the backseat together with your dog. The durable plastic straps are adjustable to suit any vehicle. With its sturdy and robust straps, it will stay in place even when your dog moves around. You can wipe clean the hammock or hose it off for stubborn dog dirt. Another product from Bowsers is this all-new seat cover in elegant printed design. This hammock seat cover features a diamond micro velvet fabric that can withstand dirt, stain, and liquid spills. Its houndstooth pattern will complement any interior car you have. You can secure this hammock using elastic side straps and metal hooks. It is safe to use in a washing machine. Its soft texture also provides comfort to your dog. The barrier also keeps your dog from falling between the rear seats during a sudden break. 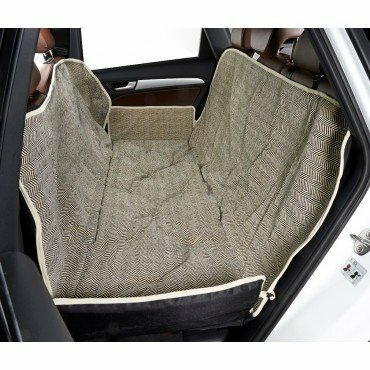 This dog seat cover doesn’t have thick padding so you can fold it up after use and secure at the back of your car. Check out this lightweight yet heavy-duty seat cover from MT-Great. Now you can provide comfort to your dogs when traveling in long distance. You can also use this seat cover for transporting gardening tools and other bulky equipment without ruining the beautiful leather of your car. Using the plastic latches, you can secure the hammock on the back seat and front seats of the vehicle. The hammock also protects the carpet of the car. You can also pull the cover of the seat, allowing your dogs to see you and feel much calmer inside a moving vehicle. 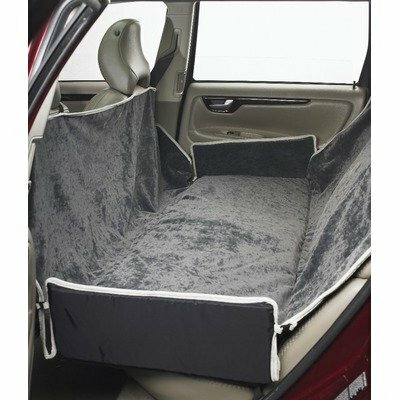 This seat cover can also be secured in the trunk of your car to keep it in place and prevent it from moving while you are driving. Heavy-constructed anchors allow you to ensure that your pet cannot chew on it. With proper care and maintenance, this seat cover can provide comfort to your dog for many years to come. 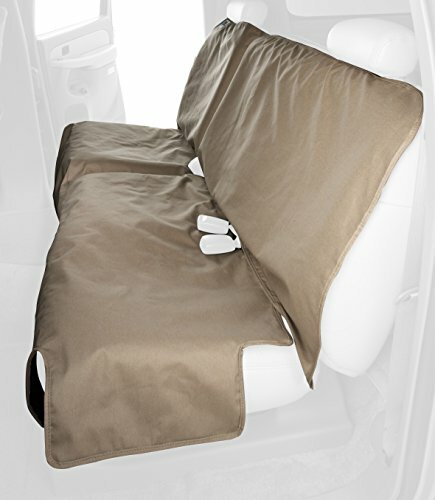 Are you looking for an elegant-looking seat cover that will match your car’s interior? Check out this dog seat cover from Orvis. 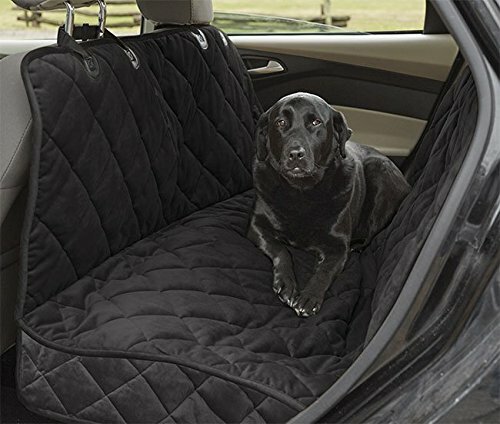 This hammock seat cover can convert the backseat of your car into a comfortable area for your dog to stay while riding. This microfiber seat provides optimal comfort and captures loose sand and dirt before it seeps into the leather seat. 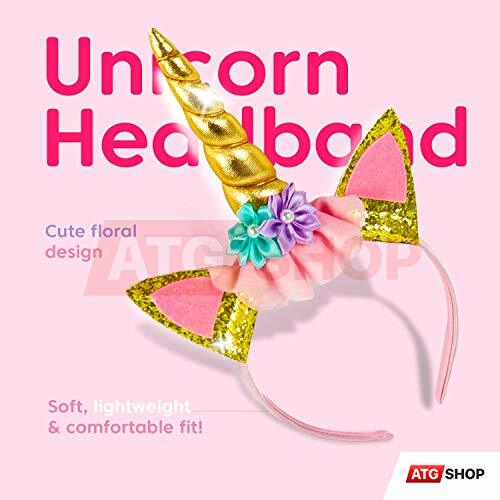 The material is breathable and waterproof. Installing this in your car is easy. You can hook it to the front and rear headrests. Through the hook-and-loop openings, you can pull the seatbelts and secure your dog while driving. If the seat cover gets too dirty, it is safe to wash in washing machine. Travel in style with this Orvis grip-tight windowed hammock seat protector. 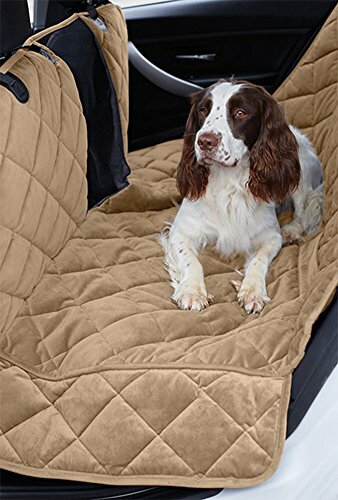 The breathable and soft-textured fabric provides full comfort to your dog while you are driving. It has a centered mesh panel on this microfiber hammock, allowing your dog to see you while driving. This handy feature also helps in increasing the flow of air inside the car. The protector is waterproof and breathable. Thanks to its quick-release latches, installation is easy as a breeze. You can hook it to the front and rear headrests without difficulty. You can also pull the seatbelts and secure your dog thanks to its hook-and-loop openings. Enjoy premium quality from Pet Craft’s dog seat cover. It covers the rigors of your seat to keep it clean and safe from your dog’s mess while riding. The 600D fabric material is highly abrasion material, allowing you to keep the leather seats safe from your dog’s claws. It’s secure and has a non-slip bottom to withstand energetic dogs. Its unique rubber bottom stays in place even if you’re riding through a rough road. It also provides optimal comfort for your buddy thanks to its quilted-gear pocket. Padded to ensure your pet’s comfort throughout the entire ride. These useful pockets can be storage for the leash, toys, and other items for your dog. This hammock dog seat is easy to install and remove, perfect for traveling with your dog. This dog seat cover from Canine Covers uses a polycotton drill fabric with durable water repellency finish. In that way, liquid spills and dog accidents wouldn’t seep into the leather seat of your vehicle. It also has a waterproof nylon liner for added protection of the covered seat. The elastic headrest can fit a wide variety of vehicles. Universal hooks and loop seat belt opening allows you to install and remove it without difficulty. 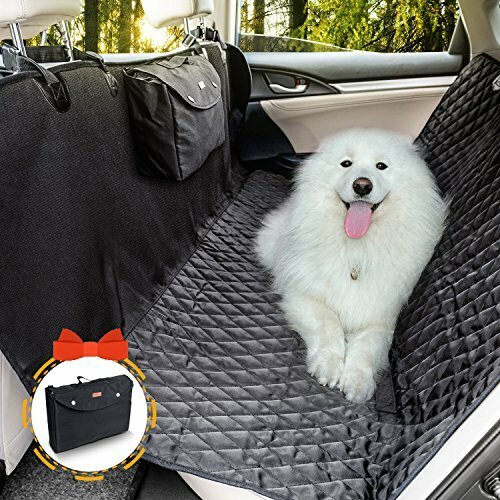 Using this dog seat cover, your buddy can be comfortable riding the car even in long distance. It is safe to remove the dirt and pet hair it has gathered. 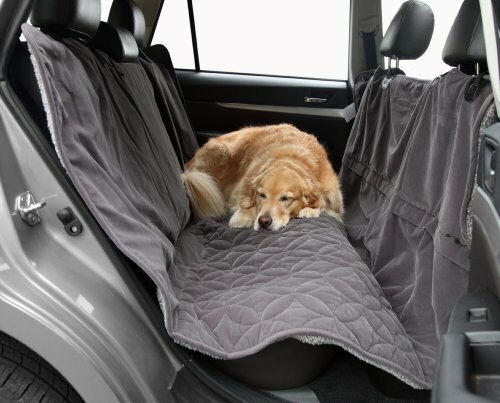 The non-slip back layering keeps the dog seat cover in place even if your dog keeps on moving around. You can choose from eight interior-complementing colors to find the perfect fit for your car. Traveling with your dog companions is not uncommon, especially for pet parents. You can’t just leave your dog unattended in your house, especially if you’re going to be away for quite a while. However, as you may know, traveling with them may also cause the spread of dirt and pet hair all over your car. In this article, we are going to help you choose the right car seat cover for your dog, along with a list of the top best-selling car seat cover for dogs. What is a Car Seat Cover for Dogs? Car seat covers for dogs are designed to protect your car from the dirt and pet hair. It allows you to travel with your dog without the worry of messing up your car. Car seat covers are made of different materials suitable for your dog’s needs. Before anything else, you might want to consider the materials used for the car seat cover. It will vary on the lifestyle of your dog. For instance, if your dog loves to play outdoors, you might want to buy a waterproof car seat cover. This is ideal for pet parents who like to take their dogs to the beach. Aside from that, an impervious seat cover is easier to clean compared to other materials. On the other hand, you can also opt for quilted dog seat covers. This kind of material is heavy-weight and durable. 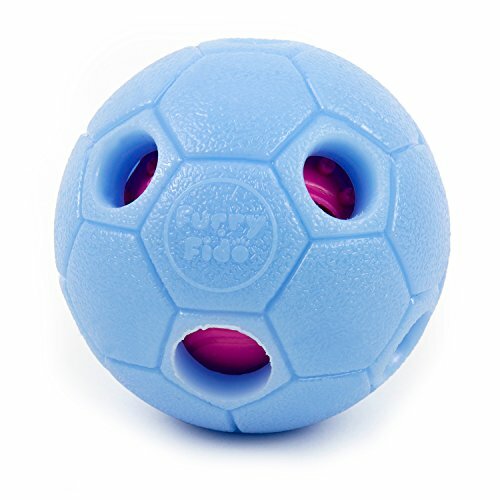 It is ideal for dogs who love to chew on things, as it will not easily break. It requires little to no maintenance, too. You can shake the dirt and pet hair off the seat cover, or you can wash the cover. Consequently, a dog car seat cover that is made of scratchproof materials is also a bonus. This is important especially if your dog loves to scratch things. You don’t want to invest in a dog car seat cover that your buddy can easily destroy. Aside from the materials used, you should also consider the style of the car seat cover for dogs. For instance, if you want to have maximum protection against dirt and fur, you might want to buy the hammock-style cover. This type of dog seat cover can protect the footwells, the bench seat, and the front seats as well. It will also help to keep your dog on the backseat of the car. Albeit the majority of dog car seat covers are designed for SUV, truck, and car use, it is still wise to know the exact measurements of your car. Some manufacturer may offer different sizes to ensure optimal use once it reaches the hands of the customer. In measuring the car seat area, start with the width of your seating area up to the rear bench seat. There are also dog car seat covers that are adjustable. It is ideal for pet owners who own a bigger car. You might want to buy a dog car seat cover that’s easy to install. In that way, you’ll be able to set up the dog seat cover anytime you want immediately. You don’t want to spend much time on installing the dog seat cover on your car and cause delay to your trip. Aside from that, a dog car seat cover that needs little to no maintenance is also an ideal choice. It helps you to easily wash the dog car seat cover and get rid of the accumulated pet hair without hassle. Some dog car seat covers are machine-washable, speeding up the process of cleaning. Lastly, you should consider the design of the dog car seat cover. Buy something that will match your car’s interior design. Some seat covers have elegant quilted design while some have canvas-like texture. Most dog car seat covers are available in black color, while some are in beige, navy blue, and earth tone colors.